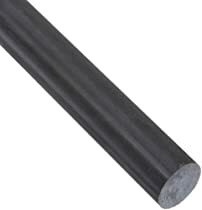 The acetal round rod has an opaque black color and meets American Society for Testing and Materials ASTM D6100 specifications. Acetal is a strong, rigid plastic that offers excellent dimensional stability, enhanced by the material's moisture and creep resistance. The material has a low-friction surface and excellent abrasion resistance. Plastic refers to a group of synthetic or semi-synthetic materials that have been engineered to achieve specific properties. The most notable characteristics of plastics are its low weight, machinability, corrosion resistance, and typically good thermal and electrical insulating properties. Certain plastic grades also offer optical transparency similar to glass, low-friction or self-lubricating surfaces, and exceptional impact resistance. Depending on their properties, certain plastic grades can be used as alternatives to metal, glass, and ceramic. Unlike metal, plastic may experience creep, which is deformation caused by longtime exposure to a constant load. Tensile strength, used to indicate the material’s overall strength, is the peak stress it can withstand before it breaks. Corrosion resistance describes the material's ability to prevent deterioration caused by atmosphere, moisture, or other medium. Wear resistance indicates the ability to prevent surface damage caused by contact with other surfaces. Toughness describes the material's ability to absorb energy before breaking, while hardness (commonly measured as indentation hardness) describes its resistance to permanent surface deformation. Impact resistance is the measure of a material’s ability to absorb a shock of energy before breaking.